A River Cruise – is it for you? 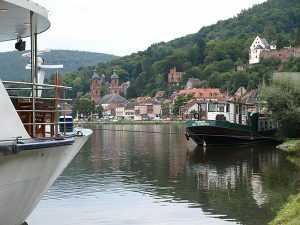 A river cruise offers a unique way to travel, especially in Europe. The river boat is your hotel as it meanders through several countries. This enables you to tour Europe without having to pack and unpack every day or two. Cruise through the heartland of Europe. Ocean cruises take you around the periphery of various countries where you visit the large crowded cities. With river cruises you sail through the heartland of each country. You see how people live. You visit villages and walled cities and go to outdoor markets. It is a wonderful way to experience travel that is authentic and different. A river cruise is great. There is no such thing as a bad river cruise. The premium river cruises like Viking River Cruises, AMA Waterways, and Avalon Cruises include all your accommodations, your meals, a sightseeing tour at each stop. They include beer or wine with lunch and dinner. They also have additional tours that you pay extra for. You also are expected to tip the staff – and you will want to as they are friendly and attentive. Several lines are now operating all-inclusive river cruises. 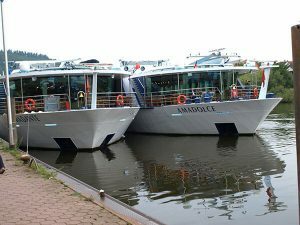 These include Tauck, Scenic Cruises, Uniworld Boutique Cruises, and Crystal, River Cruises. The inclusions vary a bit by line, but generally give you a greater choice of sightseeing tours, all included with no extras. They include the gratuities to the staff and tour directors, and all beverages, not just wine and beer. Some include butler service in all categories, and have multiple dining venues. Most all-inclusive river boats carry fewer people and have larger cabins and offer more onboard amenities. Boats dock next to each other. As the popularity of river cruises has grown, the number of boats cruising on the rivers has increased. So, don’t be surprised if your boat ties up right next one that’s already docked. Sometimes they are three or four deep. This can be an inconvenience, as you walk through the other boats in order to get to the land. However – it is also a plus, as you get to see what the others look like inside. But keep in mind that because of the size of the boats, you won’t find many thousands of people disembarking like you could on an ocean cruise. that not only accommodate families, but have special programs for them during the typical school vacation periods. Uniworld recently launched their “U by Uniworld” river cruises for millennials. In fact, on these there is a maximum age limit. There are cruises for people who like to cook – foodies. 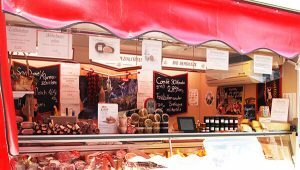 In many cases you can get out and go shopping in the local market with the chef. Then he will work with you so you can learn to prepare a meal. Because many of the itineraries are through the great wine regions of the world, there are many special wine oriented sailings. There are cruises for people who love music. There are cruises for people who love museums. And there are cruises for those who want to live like a local. You can walk, hike, bike, shop, and totally get into the experience of living like a local. We’ve touched on some of the aspects of river cruising and there are many, many more. Watch for future videos from us that will explain and expound on all these things in greater detail. If you would like to discuss the various river cruises, please contact me: george@hagers-journeys.com.